I already did ITMN short this year (successfully), so will do it again. Today news were driving this stock to $34 range, it's too much for this weak and non-effective drug. Pirfenidone (Esbriet™) is not a cure for IPF, it just reduce decline in lung function. "The primary endpoint of change in percent predicted Forced Vital Capacity (FVC) at Week 72 was met with statistical significance in CAPACITY 2 (p=0.001). The secondary endpoints of progression-free survival (PFS) and categorical change in FVC were also met with statistical significance. The primary endpoint was not met in CAPACITY 1 (p=0.501), but supportive evidence of a pirfenidone treatment effect was observed on a number of measures, including the primary endpoint. Pirfenidone was safe and generally well tolerated in both CAPACITY studies." "The pooled analysis of Categorical FVC Change showed that 30% fewer patients experienced a 10% or greater decrease in FVC at week 72 in the pirfenidone group than in the placebo group. This magnitude of decline is considered clinically meaningful as a 10% decline in percent predicted FVC has been shown in multiple studies to be an independent predictor of mortality in patients with IPF. In addition, 40% more patients in the pirfenidone group did not experience a decline in percent predicted FVC at week 72 versus baseline compared to those who received placebo." Post-hoc analyses of data from the 826-patient INSPIRE trial suggested that patients experiencing a 50-meter decrement in distance walked during the 6MWT at six months had an approximately 2.5-fold increased risk in mortality. Using this threshold, 33% and 47% of pirfenidone and placebo patients, respectively, in CAPACITY 1 (p=0.013), and 37% and 47% of pirfenidone and placebo patients, respectively, in CAPACITY 2 (p=0.032) experienced this magnitude of change. In a pooled analysis, 35% and 47% of pirfenidone and placebo patients, respectively, experienced a change that exceeded this threshold (p=0.001). Japan is very rich country and as of March 2009, Japan's population is 127,076,183. According to the U.S. Bureau of the Census, the resident population of the United States, projected to 12/18/10 at 18:46 UTC (EST+5) is 310,936,488. So, Japan population is just around 2.5 less than US population. Until recently,it was thought that only 5/ 100,000 individuals in the United States develop IPF per year. However, more recent data indicate that the incidence is much higher. Despite extensive investigation, the cause of IPF remains unknown. The disease involves abnormal and excessive deposition of collagen (fibrosis) in the pulmonary interstitium (mainly the walls of the alveoli) with minimal associated inflammation. The fibrosis in IPF has been linked to cigarette smoking, gastroesophageal reflux disease and autoimmune disorders, but none of these are present in all patients with IPF, and therefore do not provide a completely satisfactory explanation for the disease. Idiopathic pulmonary fibrosis (IPF) is characterized by slowly progressive respiratory dysfunction. Nevertheless, some IPF patients experience acute exacerbations generally characterized by suddenly worsening and fatal respiratory failure with new lung opacities and pathological lesions of diffuse alveolar damage.Acute exacerbation of idiopathic pulmonary fibrosis (AEIPF) is a fatal disorder defined by rapid deterioration of IPF. Thus, this mysterious disease hits all countries and nations. My question is: Why sales of Pirespa (pirfenodone) in Japan are not very impressive? And why they should be much higher in Europe and USA? The company has estimated that some 100,000 Europeans suffer from IPF. So this is huge news for the company today and a major win for them. Thus, author proposed $3.7B sales in Europe for this drug. In 2009 the Europe population was 831.4 million, using a definition which includes the whole of the transcontinental countries of Russia and Turkey. Just 6.5 times bigger than Japan population. Some European countries are poor and their insurance systems can't pay $37,755 per year for IPF patient. Any way even if based on Japan sales of Pirfenidone Europe annual sales should be between $12.4M and $182M. I question again here: why everybody are talking about billion sales? One word for this: madness. 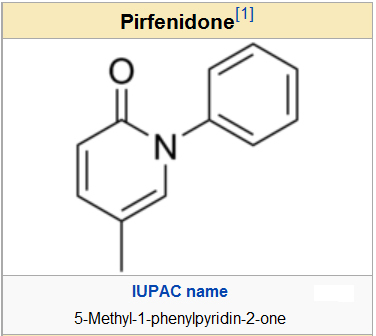 Pirfenidone is a very weak drug for IPF. It failed one trial and patient should take giant amount of drug per day to have some effect: 2.4 g per day. Key Findings: At one year, decline in vital capacity was significantly less severe in those receiving NAC compared with those given placebo (relative difference: 9%, p<0.02). DL[.sub.co] also deteriorated less in those given NAC (relative difference: 24%, p=0.003). Conventional treatment-induced myelotoxicity was also reduced in those given NAC compared with those given placebo (p=0.03). At the end of the year 9% of those in the NAC group had died versus 11% in those given placebo (NS). Disclosure: I shorted ITMN at average $33. Strange, but biotech companies with too high % held by funds and institutions usually show similar "anomalous" pps growth. I had it with JAZZ and now I see it with ITMN (%Held by Inst 97.25). I'm not a fun of "conspiracy theories" but similarity in chart pattern could have same root reason here: stock manipulation by several funds. ITMN has no real product now and will not have it during next 2 years. But numerous funds and institutions have ITMN shares that they bought at high price. They want ITMN to grow and it seems like they can do it. I underestimated this factor again. Well, the lessons are learned. I will include this factor (factor FIM i.e.funds and institutions manipulations) in future short trades. I covered ITMN today (losses was compensated by successful XOMA shorting). ITMN has too high FIM factor to have it short (in scale between 0 to 10, ITMN has 9, JAZZ has highest i.e. 10 and XOMA has 0). In my future trades I will take into account this new factor. Hope it will help me to avoid such mistakes as JAZZ and ITMN (recent short). Well, I can only repeat again here: "Experience is like the son of difficult mistakes". ITMN is still pumped by big holders and current pps is $37. Of course, big holders are hoping that Europe will approve ITMN drug for IPF that was rejected by FDA because of very low efficacy (if any). Actually ITMN was "resurrected" because "a recommendation for the grant of marketing rights for Esbriet in treating a fatal lung disease was made by the Committee of the European Medicines Agency. News of the positive opinion from EMA sent InterMune shares soaring to about $32.56 on the Nasdaq, which is more than double its last closing price of December 16. Normally, a recommendation by EMA's Committee for Medicinal Products for Human Use, which is responsible for reviewing all marketing applications, usually culminates in an approval." But what is "normally" for Europe? Is it means that European regulators don't care about FDA desisions at all. It seems like that it's not completely true. Recently European regulators voted against approving its multiple sclerosis drug Fampyra, saying it was not convinced the drug's benefits outweighed its risks. The decision surprised investors and sent Biogen's stock down 3.3 percent. Shares of Acorda Therapeutics Inc (ACOR.O), which developed the drug and sells it in the United States under the brand name Ampyra, fell 16 percent. In 2009, Biogen paid $110 million for the right to market the drug, also known as fampridine-SR, outside the United States. It agreed to pay up to $400 million more, and a double digit royalty, if the drug met regulatory and sales goals. Irish drugmaker Elan Corp (ELN.I) manufactures Ampyra. It is unusual for a drug to be rejected in Europe after being approved in the United States. "We and most of the Street were expecting approval given the unmet need in Europe and the fact that it has been approved in the U.S. last year with a robust uptake," said JPMorgan analyst Geoff Meacham. Questions is: Is it usual for a drug that was being rejected in USA to be approved in Europe? Esbriet was rejected by FDA because of no proof for efficacy (1 from 2 clinical trials failed to show any signs of improvement for IPF). FDA asked ITMN to do one more clinical trial and ITMN agreed and started new IPF drug trial. So, why Europe should approve this drug (may be useless one)? They can just wait 1-2 more years and after trial results (if positive) approve this drug. Esbriet is very expensive drug ($37,755 per year for one patient). It's really terrible and fatal lung diseasecharacterized by shortness of breath. There are no approved drugs either in the U.S. or Europe to treat IPF that is said to affect 200,000 people in both the regions. "ITMN said that market research suggested pricing for pirfenidone could be comparable to that of pulmonary arterial hypertension drug Tracleer (bosentan) from Actelion Ltd., which goes for between $40,000 and $45,000 per year. That would put pirfenidone's market potential at more than $3 billion." Will this drug cure IPF patients or prolong their life? No, they will only breath slightly easier before death. "Upon ratification, the company will sell the drug in all 27 member countries of the European Union." Some of these 27 countries are not rich and they can't pay this money for useless drug that not cure IPF. ACOR drug was rejected by European regulators (drug is approved in USA) that were not convinced the drug's benefits outweighed its risks. Will these regulators approve much more expensive and may be absolutely useless drug that was rejected by USA FDA? I don't think so. I see a very high probability of ITMN drug rejection in Europe. "Like in the U.S., though, a favorable opinion/recommendation does not guarantee final approval, nor the possibility of restrictive labeling. Nevertheless, it is notable that this process moved along quite quickly - CHMP could have come back to the company with a further list of questions/issues, but instead decided it had enough information to issue its recommendation. At this point, then, a final decision will come within 60 calendar days"
I.e. it was recommended in December 17 + 60 calendar days - February 17 is a approximate date. We have 1 week before this event. If Europe reject ITMN drug we will see ITMN pps much below than it was right after FDA CRL (average $9). The current pps is $37 so downside could be more than -75-80% i.e. $7 pps. Well, what about pps after approval? $100! No way, but $55 is possible. Risk vs reward: +$18 per share vs -$30 per share. 1000 shares short. Approval = -$18k losses. Rejection = +$30k gain. Disclosure: I don't have ITMN short positions now. May short ITMN any time. So, we have an Europe approval for ITMN IPF drug and pps just below $40. Nobody wants to buy it for $50. It seems like a good sign to short ITMN at this price. During some time I will avoid to buy stocks but short positions are OK. If some "Black Swan event" really happens and market crashes only short positions will be profitable. "InterMune plans to launch the drug in the top five European countries first, beginning with Germany in September 2011, followed by France, Spain and Italy in the first half of 2012 and in the United Kingdom in mid-2012. It is expected to be launchedin almost all the 10 important European nations by mid-2012." Well, that is interesting... I mean "in almost all the 10 important European nations..."
What is about "not important European nations"? "Idiopathic pulmonary fibrosis is a fatal lung disease with an estimated survival rate of a meager 20%. Approximately 110,000 patients are diagnosed with the disease in the 10 most important European countries, including about 70,000 patients having mild-to-moderate IPF and are thus eligible to take Esbriet." Is it means that IPF patients in the not important European nations should die without any help? A new therapy shows promise for patients with mild idiopathic pulmonary fibrosis. According to researchers in Japan, inhaled N-acetylcysteine (NAC) monotherapy preserves more lung function in some idiopathic pulmonary fibrosis (IPF) patients than no therapy. The findings will be presented at the 2010 American Thoracic Society International Conference in New Orleans. "This novel study provides encouraging evidence to pursue the potential of an efficacious treatment with NAC for patients with the early stage of IPF in a well designed clinical trial. In that sense, the finding was expected," said Sakae Homma, M.D., Ph.D., professor of the Department of Respiratory Medicine, Toho University School of Medicine in Tokyo. IPF is a lung disease characterized by progressive scarring of the lung tissue, which ultimately loses its ability to transport oxygen. Once diagnosed, half of IPF patients die within three to four years. IPF has no known cause or effective therapy. It is hypothesized that an oxidant-antioxidant imbalance may contribute to the disease process in IPF. Acetylcysteine, which is a precursor to the antioxidant glutathione, may be reduced in the lungs of patients with IPF. In this study, Dr. Homma and colleagues compared 48-weeks declines in forced vital capacity (FVC) and diffusing capacity between 100 IPF patients who were randomly assigned to receive treatment with 352.4 mg of inhaled NAC or no therapy. They then compared baseline FVC -- a measure of lung function -- to FVC after 48 weeks of treatment. In a subset of patients with mild IPF (defined as initial %FVC less than 95 percent of predicted, or initial %DLco less than 55 percent of predicted) therate of decline in lung function was significantly lower in those who had received the treatment than in those with no therapy. "This shows a significant benefit for patients who received NAC compared with those who received no therapy," said Dr. Homma. The researchers also analyzed certain secondary endpoints: change in the lowest oxygen saturation; walking distance during a 6-min walking test; pulmonary function tests; serum inflammatory parameters including; chest computed tomography (CT) images; and subjective symptoms such as dyspnea. Among the secondary endpoints analyzed, a positive treatment effect was also demonstrated in change in %VC predicted in the same subset of mild IPF patients. Chest CT images improved in 8.6 percent of the treated group. Furthermore, there were no serious adverse events in the treated group. "Our study compared the differences between NAC-therapy arm and a true 'no-therapy' arm and demonstrated a therapeutic effect on physiologic measurements in IPF," said Dr. Homma. "Hence, this randomized control trial results are novel findings. I expect that our study will serve as a guide to develop a new therapy for IPF in the future." The researchers intend to continue to monitor the progress of the subjects in this study. "Since we have obtained positive results in patients treated with NAC for IPF without any immunosuppressive or anti-fibrotic agents, we expect it to be one of the candidates for IPF therapies. At this point, there is no cure for IPF. From that standpoint, it is of a great significance for us to establish a new therapeutic strategy from the early stage of IPF," said Dr. Homma. "We will continue the follow-up of the patient cohort included in this study to identify whether NAC can contribute to the prolonged survival of patients with IPF. In addition, since NAC is thought to be an antioxidant agent, it is expected that the indication will be extended to interstitial lung diseases other than IPF. "Other clinical studies of NAC therapy are currently underway in the United States. We hope that our study results will be reproduced in those western clinical studies," said Dr. Homma. "The decline in 6MWT distance from baseline to Week 72 was significantly reduced compared with placebo in this study (p <0.001, rank ANCOVA). Additionally, in an ad hoc analysis, 33% of patients receiving Esbriet showed a decline of ≥50 m in 6MWT distance, compared to 47% of patients receiving placebo. In a pooled analysis of survival in PIPF-004 and PIPF-006 the mortality rate with Esbriet 2403 mg/day group was 7.8% compared with 9.8% with placebo (HR 0.77 [95% CI, 0.47–1.28]). The third study (SP3) in Japanese patients compared pirfenidone 1800 mg/day (comparable to 2403 mg/day in the US and European populations of PIPF-004/006 on a weight-normalised basis) with placebo (N=110, N=109, respectively). Treatment with pirfenidone significantly reduced mean decline in vital capacity (VC) at Week 52 (the primary endpoint) compared with placebo (-0.09±0.02 l versus -0.16±0.02 l respectively, p=0.042)."